I'm very pleased to say our lovely neighbors, Red, White, and Bubbly, and Acme Wines & Spirits are sponsoring our opening party for Portraits of Women: Icons and Feminists Thank you to Adam and Donald for your generosity, we will raise a glass to you. I'm also happy to report that Brooklyn Frameworks is offering a framing deal to any of you who purchase pieces from the show. There will be examples of the frame style (simple, clean, modern) on a few of the pieces so you can see them. George does excellent work and has been a pillar of our community for over 18 years..
Shop local people, and appreciate the small businesses in your community who contribute to making us the vibrant community we are! Our latest in-store project: screen printing. 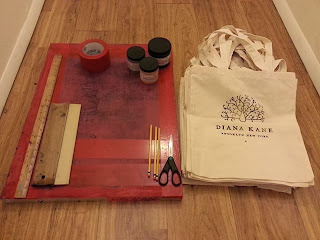 We spent our Friday afternoon creating Diana Kane tote bags. Don't be intimidated by the screen; join the fun. The initial process may take some time, but once your screen is exposed and the image is on it, the possibilities are endless. No clue how to expose a screen? No worries. Places like Brooklyn's Gowanus Print Lab are totally happy to help you out (i.e. do it for you). We had fun experimenting with mixing the inks. Working with black, silver and gold ink, we watched them work their magic and overlap to create beautiful textures unachievable with any other medium. Don't forget to cure your ink. Heat setting with an iron is essential to guarantee the ink will not wash off.